The First edition of WINGS 2017 – “Sab Uden, Sab Juden”- Expanding Regional Connectivity was hosted in New Delhi yesterday by the Ministry of Civil Aviation. The Plenary session was chaired by the Union Minister of Civil Aviation, Shri P. Ashok Gajapathi Raju and the Union Minister of State for Civil Aviation, Shri Jayant Sinha was also present on this occasion. During the Wings-2017, Interactive sessions with Stakeholders of entire Ecosystem such as Tourism Departments, Tour Operators, Airport Operators, Cargo Operators, Aircraft Manufacturers, Engine Manufacturers and other players in the value chain was convened. The States enthusiastically capitalized upon the unique platform provided by the ministry, wherein they had 112 one to one discussions (G2B meetings) with the Airlines operators in an attempt to showcase their destinations and routes as viable business market for the airlines. The State Governments being one of the key stakeholders in the Aviation market and is keen to develop its Aviation sector and enhance air connectivity in the region and beyond. This event proved to be an ideal platform for States to project themselves as a viable Aviation market and showcasing the strength and opportunities in the Aviation sector to the potential airlines. The WINGS-2017 lived upon the expectations and served as a unique outcome oriented platform for the stakeholders of the entire ecosystem in the Civil Aviation sector. Some notable outcomes expected from the forum are identification, marketing of new routes, destination and most importantly making flying accessible to the citizens across the country. The Secretary , MoCA Shri Rajiv Nayan Choubey , Shri B S Bhullar, Director General of Civil Aviation, Dr. Guruprasad Mohapatra, Chairman, Airports Authority of India, Ms. Usha Padhee, Joint Secretary, Ministry of Civil Aviation and Mr. Pratyush Kumar, Chairman, FICCI National Aviation Committee have also attended the sessions. India is one of the fastest growing aviation markets and currently the ninth largest civil aviation market in the world. It is projected to be the third largest aviation market by 2020. The 33 unserved airports are being added for scheduled flights in one year as compared to 75 operational airports during last 70 years. The Airport Authority of India (AAI) plans to revive and operationalize around 50 airports in India over the next 2 years to improve regional and remote air connectivity. 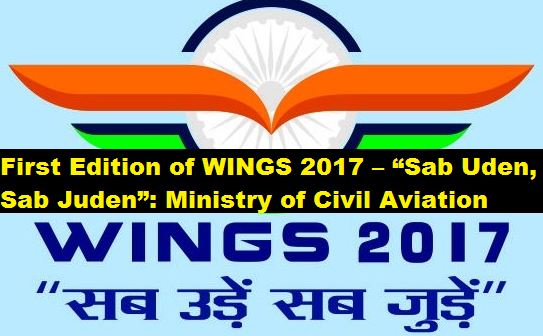 First Edition of WINGS 2017 – “Sab Uden, Sab Juden”- Expanding Regional Connectivity Hosted in New Delhi, The event saw participation from 28 States and Union Territories and out of this 19 states and Union Territory made presentation emphasizing the incentives or special packages to the airlines other than the support offered by Government of India under RCS- UDAN.